Is this the Most Expensive Restaurant in the World? To begin with, and now that you’re hooked, when we say “most expensive”, we mean the most expensive to run, not to eat – but more on that later. Mercedes me Store has relaunched with a no-expense-spared design, enormous advertising campaign, lavish showcase cars, what they describe as “the best or nothing” from European and Asian cuisine and a 6,000-square-foot premises smack bang on the otherwise restaurant-free street-level thoroughfare of Queen’s Road Central. 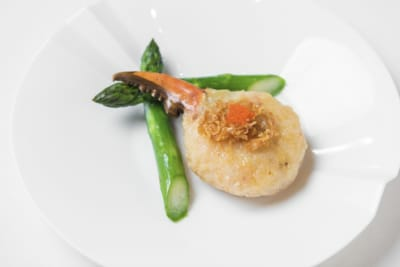 The newly relaunched cuisine-meets-cars concept is a costly coupling, with a modest estimate of all the factors going into this new enterprise running into the millions – and that’s monthly. If you didn’t have the chance to eat at the original version of Mercedes me Store, here it is in a nutshell: upon entrance, you were confronted by an S-Class parked in the centre, exuding the vibe of a flash car showroom. The space then gave way to a moody and refined restaurant within. It’s a hard concept to pull off – luxury motors combined with Latin American fine dining – and we’re not sure it completely worked. Our only previous experiences with cars+cuisine have been at American-style drive-throughs. And this was certainly not that. Admittedly quite pricey, the original Mercedes me actually had dynamite dishes hidden behind the vehicular distractions, courtesy of talented and passionate Spanish chef Edgar Sanuy. Car enthusiasts and executives alike seemed to enjoy it. 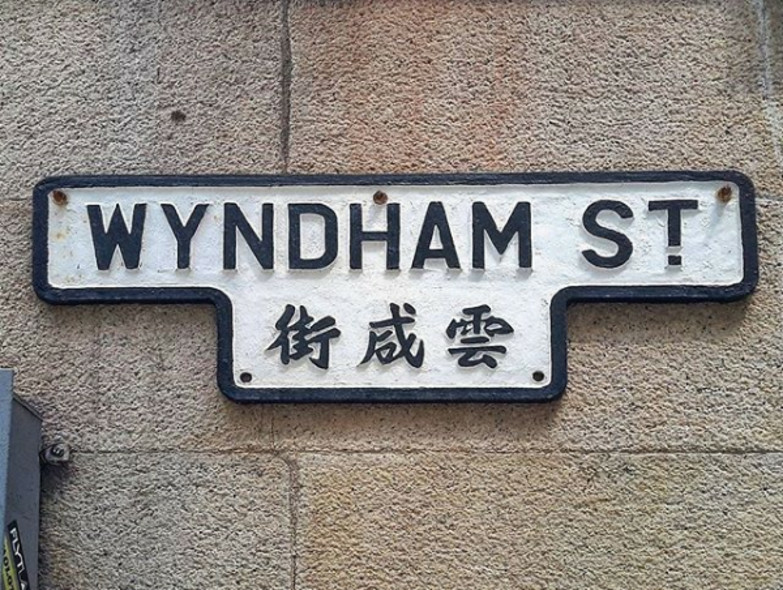 Located right at the start of Lan Kwai Fong, it was the preferential place for well-monied business meetings, doing a buzzing trade for breakfast – the combination of automobiles and eggs served as a beguiling talking point to open up whatever dealings were about to be put on the table. So perhaps it did work, but we weren’t quite Mercedes me’s audience. But, now, they’ve moved next door and are eager to attract a cosmopolitan crowd. Mercedes me Store 2.0 has a space that is bigger, more extravagant and more costly than ever. You only need to rent a small flat in Hong Kong to know that the rents here are ludicrous, or just have a look at the F&B boneyard over the past decade. In a city where restaurants close as often as they open, the unsuccessful are quickly priced off the market, with menu items that could never be listed high enough to afford the monthly ransom demands of landlords. Not all have fallen victim to the cruel economics of the dining scene here, but those that do survive the rip-current rental rises of Central, in particular, are few. And those that can afford to pay upwards of HK$2 million per month are very few indeed. So that’s where Daimler has zoomed in. As of last year, Hong Kong has again been ranked as one of the world’s most expensive cities to live, mostly owing to rental prices, says Swiss private bank Julius Baer. The SAR surged two places to overtake even Shanghai. The ranking includes 22 different factors that, along with rent, include high-quality dining. Up on Wyndham Street, restaurants pay as much as HK$1million per month in rent, but this is a whole new bracket for a restaurant; Mercedes me Store’s rent is more than double that. Russell Street in Causeway Bay, one of the world’s most expensive for retail, currently rents to watch and jewellery brands for HK$1,000 per square foot at street level, with no restaurants able to go near that. And Hong Kong is not alone in its restaurant rental struggle. 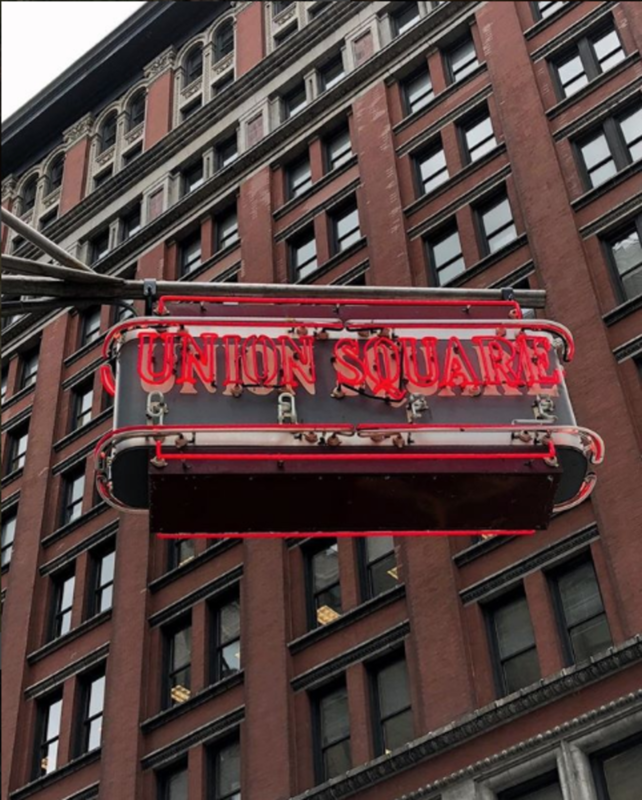 New York’s iconic Union Square Cafe was forced to move in 2014, after three decades of operation, due to an enormous rent hike that even successful Eleven Madison Park and Shake Shack founder Danny Meyer couldn’t shoulder. 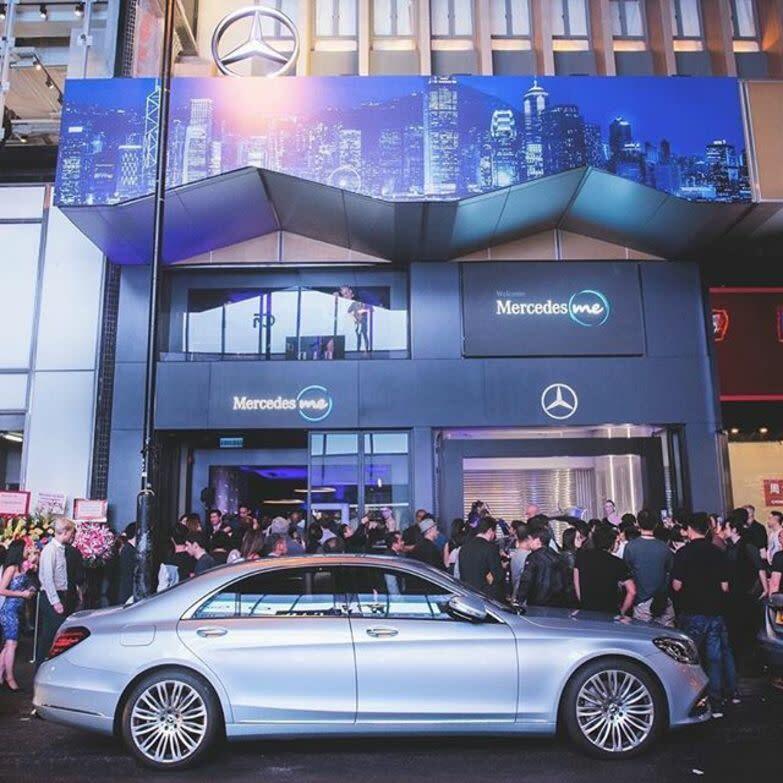 Mercedes me Store has also invested in plenty of prime space with massive billboards on every method of transport throughout the city, with “Mercedes me” – and the ambiguity of what exactly that is – plastered on buses, trams and throughout the MTR. 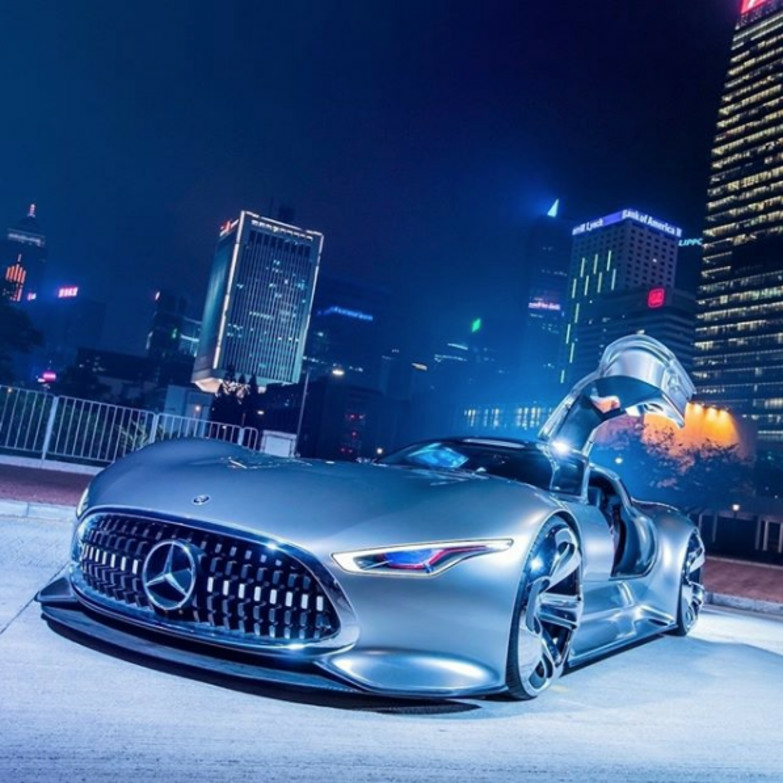 During the launch event last week, they showcased an AMG Vision Gran Turismo concept car (as seen in Justice League), which Head of Marketing and PR for Mercedes-Benz, Peter Larko, calls “pretty much priceless”. The current model in the restaurant “garage” is a S63 Coupe listed at nearly HK$3 million. The “garage” is part of the German “Haus” design for the restaurant, with a garage, living and dining spaces and kitchen, all open and integrated like a home (complete with a walk-in wardrobe where you can don and purchase all the Merc merch). There is a back door to the house too, where, late at night, you can sneak in – or out – of the bar like a teenager escaping curfew. 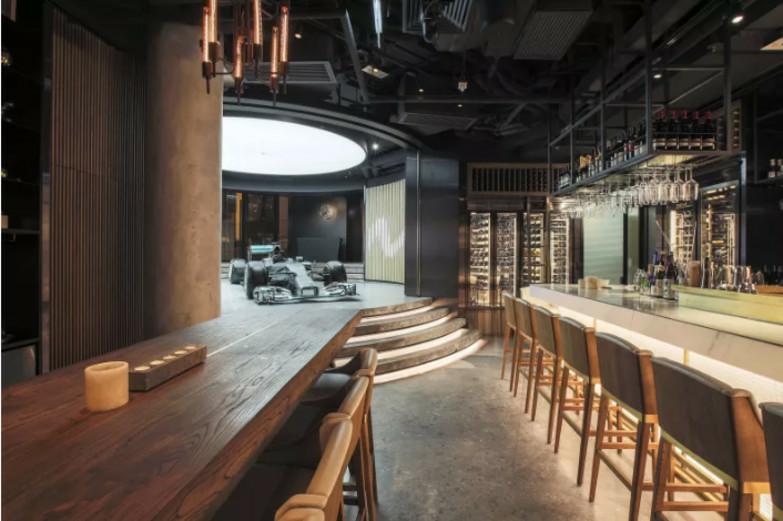 Maximal Concepts, the long-standing group partnering with Mercedes-Benz to create the restaurant, has also built some of the city’s most ambitious and progressive restaurants. There’s Blue, which was something of a gamble when it opened on the more remote end of Hollywood Road, pre Sheung Wan becoming cool and back when no one thought people would travel that far down for supper. Brickhouse remains a constantly busy nightspot as well as a villagesque venue showcasing local and international artists. 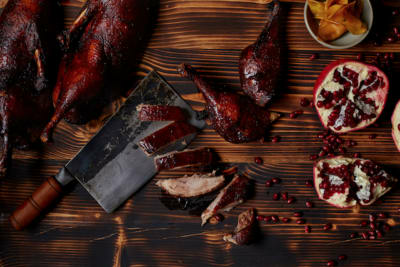 Mott 32, the fine Chinese that sits swankily beneath the Standard Chartered building, is opening in five other cities this year, with Vancouver already launched last year. Now, for the most important part: the food. Helmed by Maximal Executive Chef Russell Doctrove and Head Chef Joaquin Elizondo, previously from the kitchen of Michelin-starred restaurant Pur’ by Jean-François Rouquette at Park Hyatt Paris-Vendôme, Mercedes me Store showcases modern, casual dishes made with premium ingredients from Europe and Asia, fusing them to create inventive shared plates. 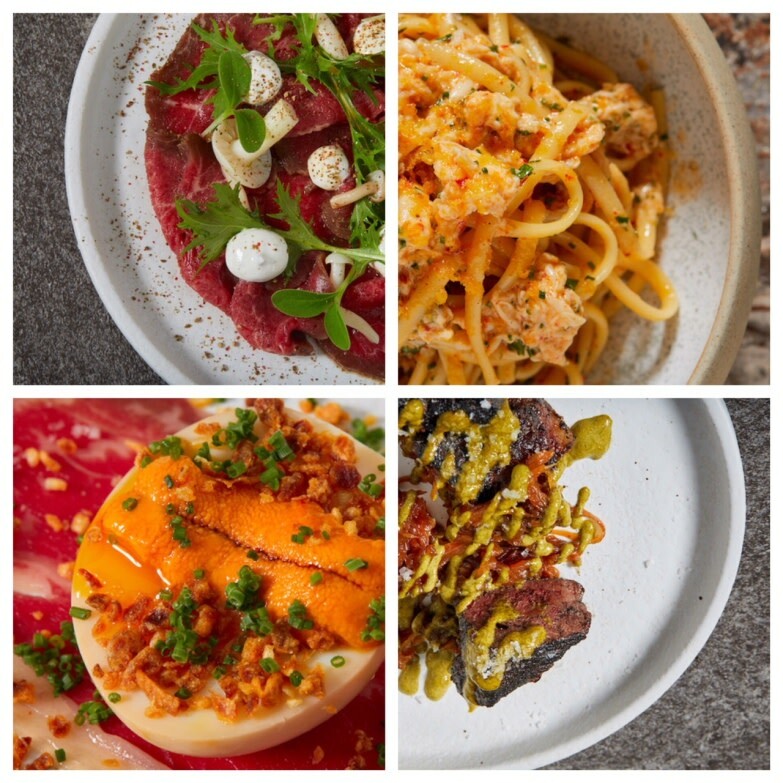 Lowering the price point from the previous Mercedes me sees dishes starting from $55, with items like beef carpaccio ($169), fire-roasted aubergine ($55), roasted monkfish ($320), tri-tip burnt ends ($65) and Jerusalem artichoke ($65) up for ordering. 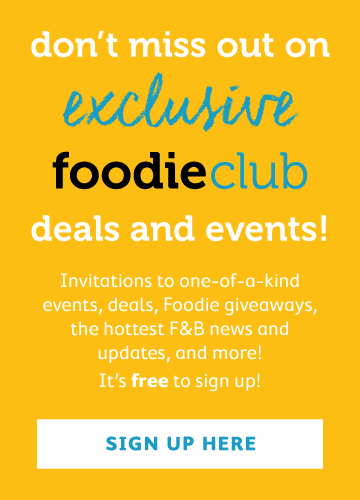 The food was our favourite part of the previous iteration of Mercedes me Store, and the dishes and lowered price point have definitely got us revved up to see if they make their food the way they make their celebrated cars. 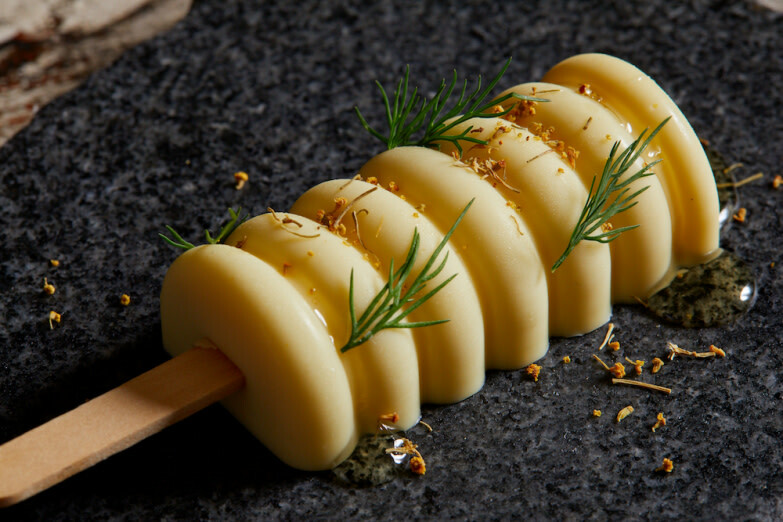 Mercedes-Benz is credited with creating the first petrol automobile, so perhaps this innovation will continue with the first successful fusion of cars and cuisine. Either way, we’re looking forward to giving a kick to the tyres to find out.